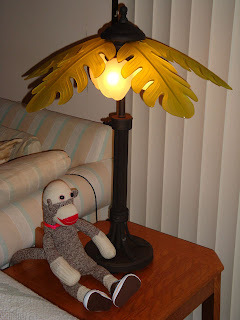 Last weekend, I bought two new coconut palm tree lamps at Lowes. 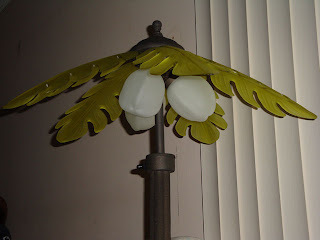 They are suited for indoor or outdoor use, but we're using them inside as end table lamps. Here's a better view of the coconuts. There are two settings for the lamp. Here I am half lit. Yes, I'm expecting you to comment on that statement. Here I am fully lit. 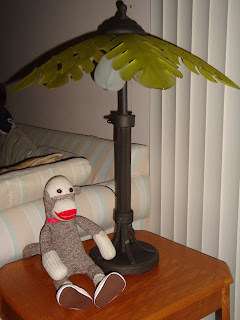 I think I may speak to the executives at Lowes about designing a banana tree lamp as well. 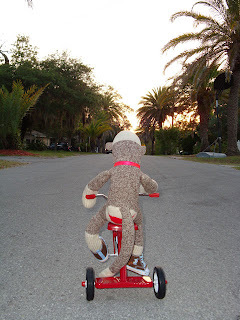 One of my favorite pastimes is cruising around Crystal Beach on my trike. There's a community pier just a short ride from my home which boasts a fantastic view of the Gulf of Mexico. 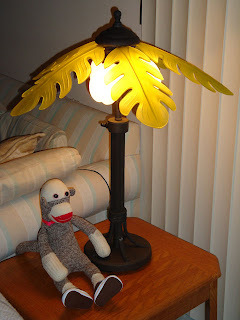 I'm trying to find the perfect spot to set up my new banana hammock. This location provides a nice view of the coastline of Crystal Beach. Can you see all the tall skinny palm trees in the distance? I think I'll venture out to the end of the pier to see what's happening there. 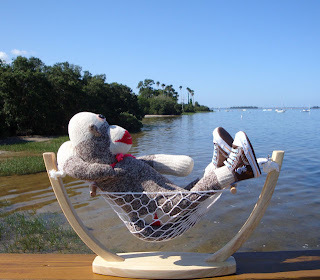 Now this is probably the best spot for me to enjoy the serenity of my surroundings in the banana hammock. Does it get any better than this? I am so fortunate to be living in paradise. 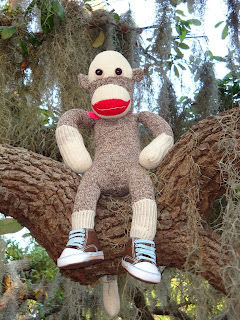 Some of my little monkey friends are in tow on this journey. They were anxious to try out the new banana hammock as well. It's getting close to lunchtime, so we're going to enjoy a picnic by the water on this beautiful afternoon. 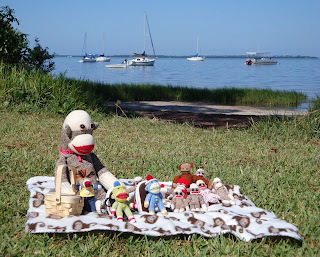 I rode my hog along the shoreline of Crystal Beach to scope out the perfect spot for a picnic with my little buddies. This grassy spot looks just right with a view of the various sailboats anchored offshore. 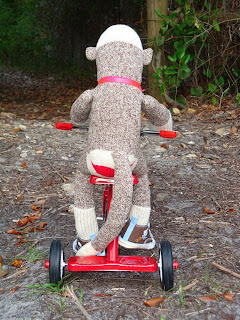 The little monks and I will be feasting on peanut butter and banana sandwiches which are tucked away inside my picnic basket. My belly is full, and I'm ready for an afternoon snooze. What a way to spend the day! 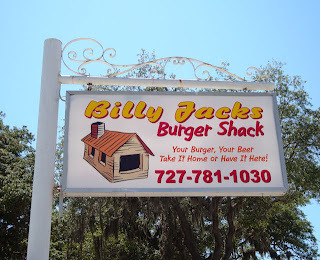 We went to Billy Jacks Burger Shack in downtown Palm Harbor for lunch on Saturday afternoon. Billy makes a mean burger at a reasonable price. He also offers a $1 draft beer special all day. Besides being a restaurateur, Billy is also a poet. Just read his sign below. "Your Burger, Your Beer. Take it Home or Have it Here!" Normally we eat outside, but it was very hot on Saturday so we sat indoors for a change. 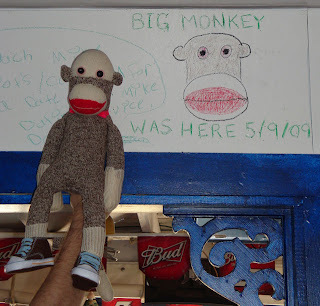 The walls in this room were covered with customer graffiti, which Billy encourages. In fact, the wait staff will gladly provide crayons to anyone who requests them. I went to work while we were waiting for our order to arrive. I did the best I could on this self portrait, considering that the crayons didn't stick to the paint very well. Now everyone that comes to Billy Jacks will know my name! This was a really cool neon sign inside the restaurant. 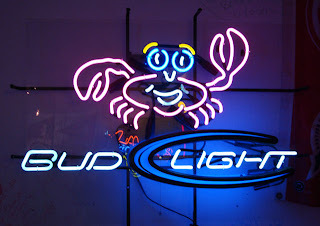 I thought I'd include a photo of it - the Bud Light Crab. He looks very happy, so he must enjoy drinking Bud Light. 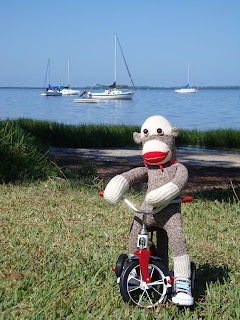 One of my favorite pastimes is riding my tricycle around Crystal Beach. Just down the street from my house, there's a small pond. You can find ducks, turtles, and other creatures here. I guess they heard me and my hog coming down the road because there's no one to be found. 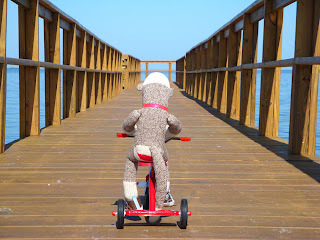 Now I'm headed down to the Pinellas Trail which is an awesome path for cycling, walking, rollerblading, etc. 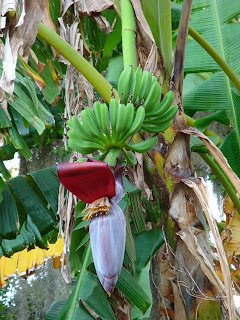 Look what I found alongside the trail - a banana tree! Man, I wish those babies were ripe for the picking! Check out the gigantic purple banana flower which is drooping because he's so heavy. Crystal Beach is the perfect place to watch the sun set over the Gulf of Mexico, which is at the end of this street. I should pedal faster so I don't miss the green flash. Dusk is upon us. I am enjoying the serenity while I contemplate my favorite moments of the day. New Cell Phone and New Sneaks! A few weeks ago I got a new cell phone. This may not seem like a big deal, but it replaced an old dinosaur that I'd had for almost 9 years. People used to look at my old phone and laugh! A good analogy for you techno geeks out there is old cell phone vs. new cell phone is like DOS vs. Windows. 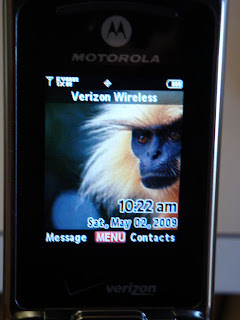 I've entered the 21st century with my brand new monkey phone. 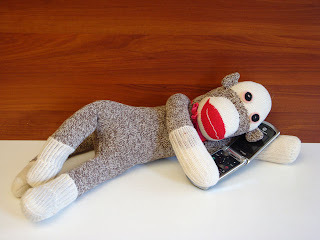 Why do I call it the monkey phone you ask? This is why. There's a fuzzy blond haired monk that appears every time I turn the phone on. When I was shopping at the Verizon Wireless store, this was the feature that sold me. Now I am working on downloading a chimpanzee ringtone. This will truly make my new phone complete. Last weekend, I bought a new pair of sneaks at Walmart. You can find just about anything there. One of my humans (I won't mention any names) spends hours there at a time. 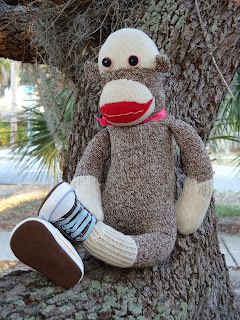 I put my new sneaks to the test by climbing some of the best trees that Crystal Beach has to offer. Now that I've made it to the top, I'm just going to hang out for a while. 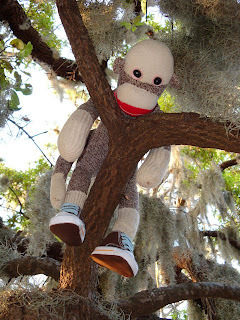 All I need is a good book and a banana, and I could just chill out in this tree all day. Hola chicos and chicas! 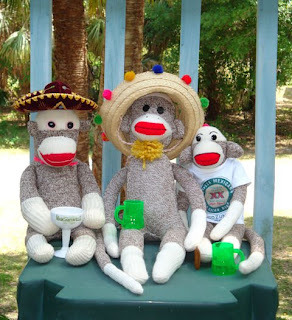 The Tres Amigos are ready to get this fiesta started. 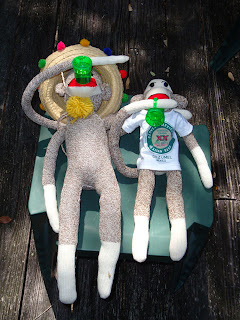 Chiquita and Herbert are dressed for the celebration. 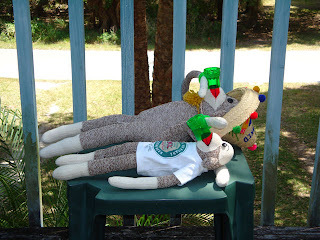 This is Herbert's first Cinco de Mayo in America, but I'm confident he can keep up with us. 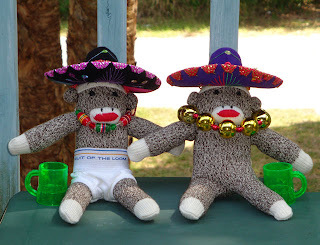 The Monkey Brothers, who wear sombreros all year round, have been counting down the days until Cinco de Mayo. Chiquita and Herbert challenged each other to a competition called Tail Shots. See how fast you can finish your tail held drink. 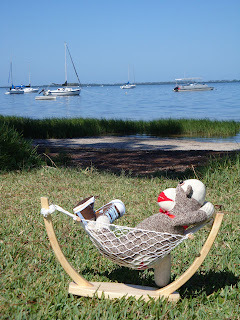 It may be Herbert's first holiday in America, but he's had lots of practice in his homeland of Australia. 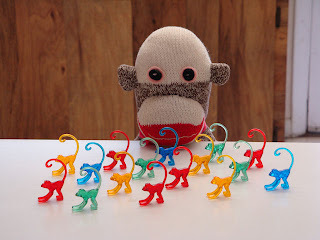 Go monkeys go! And the winner is... it's too close to call. 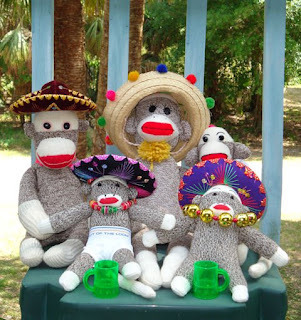 We hope your Cinco de Mayo is filled with fun and friends to celebrate with. 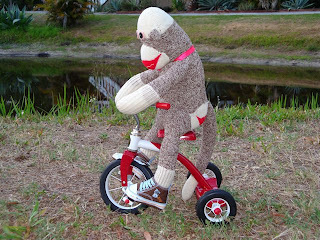 Who's Got the Monkey? I Have ALL of Them! 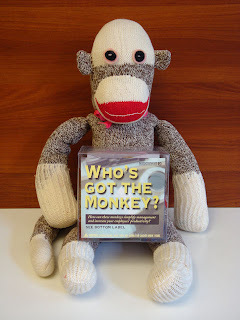 I recently received Who's Got the Monkey? as a gift from Laura's assistant manager at the bank. 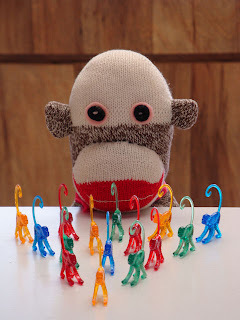 There's a whole army of red, green, blue and yellow fine monkey soldiers inside the box. The intent of this product for humans is to see "How these monkeys simplify management and increase your employees' productivity?" Please allow me to quote the product description on the back of the box. "Do you find yourself repeatedly solving your employees' problems for them? And do your own duties keep falling behind as a result? Every time an employee comes to you about a problem, they are in effect asking you to take the problem away. If you respond, I'll look into that, the immediate responsibility shifts. 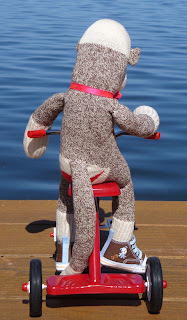 The employee has just unloaded the monkey on his back - and guess whose back it's on now? Learn how to make sure the work you delegate doesn't end up on your back with this simple technique. 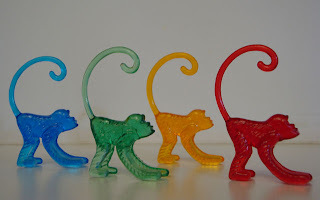 Keep these monkeys on your desk, and carry a few in your pocket for those impromptu hallway meetings. When one of your employees comes to you with a problem, hand them a monkey. Let them know that the monkey represents the problem, and that the person holding the monkey is the person who must make the next move. 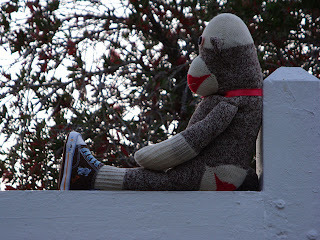 Each time the employee comes to talk to you again about that particular problem, put the monkey on a table between you. At the end of the meeting, make sure the monkey leaves with the employee; that is, make sure the problem hasn't been transferred to you. 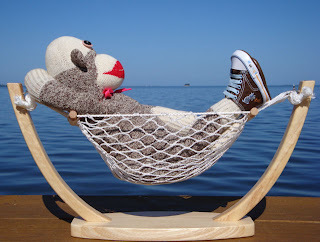 When the problem is resolved, then - and only then - the employee can unload the monkey." If I can just voice my personal opinion here. I resent the fact that these cute little fellows are supposed to represent problems. If you ask me, the problem is the lazy human who won't do his own work. The blue soldier is Brave Bobo. The green soldier is Gritty Gump. The yellow soldier is Yankee Doodle. The red soldier is Radar Regis. I feel like the General commanding his troups to organize and march. General Big Monkey, we have a special mission to accomplish. Look what an army of monkeys can do if they set their minds to it. I'm proud of my troups.